Linz 2009 European Capital of Culture - The Website. 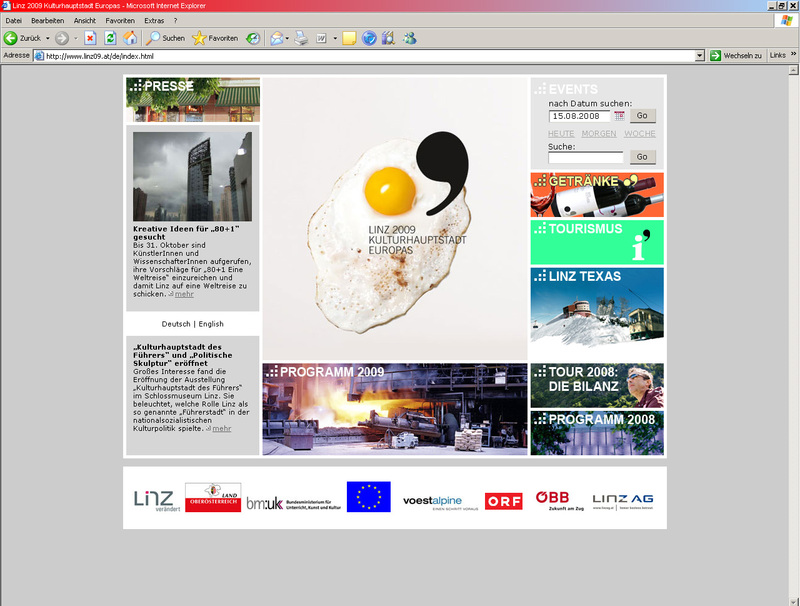 Linz09’s website, www.linz09.at, first went on stream in December 2005 and will continue to exist as an archive after Culture Capital Year. The website is available for the most part in German and in English and was expanded in several stages. The aim was to combine on one platform and in a comprehensive manner all kinds of information of interest to visitors. 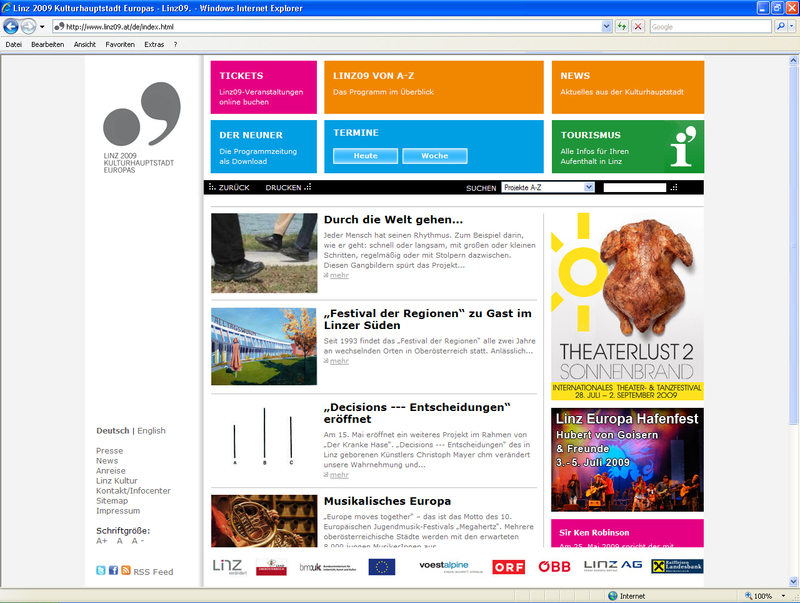 This meant the website had to include access to a hotel online booking system, travel information, an online ticketing system, a web shop, a city map and detailed information on the programme of Linz09 with daily updates and references to cultural and leisure time programmes on offer in the region. The opening of a tourist website in the first quarter of 2008 proved crucial in this context. The publication of Programme Book 3 in November 2008 necessitated changes in the website. A feature for the retrieval of event dates and projects was added and the website was linked to Ö-Ticket. 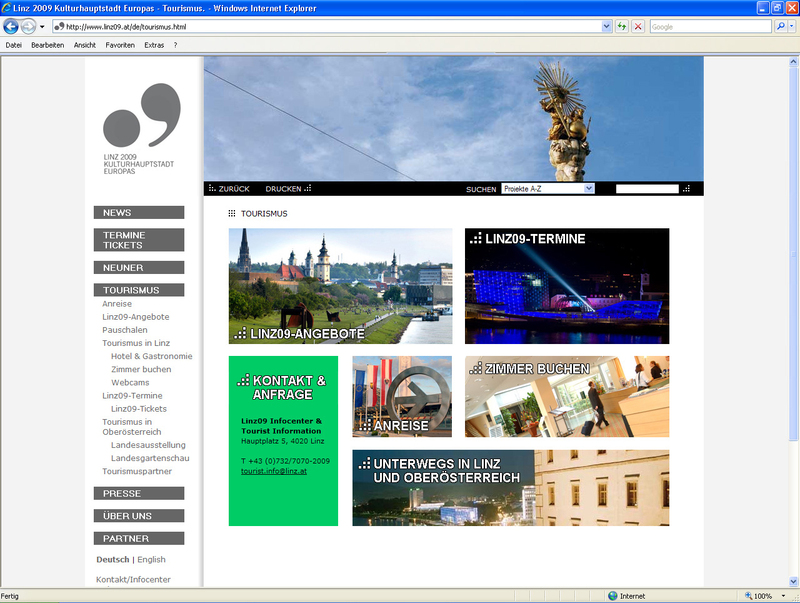 The welcome page of the website was redesigned in spring 2009 to ensure better navigability of the increasingly packed Linz09 programme. This enabled not only the direct retrieval of project dates but also the inclusion of up to six editorial references to specific projects and the parallel promotion of projects through banner subjects differing in size and placement. In Culture Capital Year the website www.linz09.at was accessed 3.9 million times; the number of accesses was more than twice in 2009 from what it had been in 2008. A sudden rise in the number of accesses became noticeable in November 2008, as preparations for the Big Bang were getting underway, and they peaked in absolute terms in January 2009. After that, access numbers levelled out at around the numbers recorded in December 2008. They did not fall off until autumn 2009. More than 8,500 people subscribed to Linz09’s newsletter, which was sent out on a monthly basis from April 2006, switching to once a fortnight from December 2008. 38% of the subscribers actually read it. The Linz09 season ticket, the so-called Insider ticket, generated another 5,000 subscribers, who received their own Insider newsletter, with offers of discounted tickets, competitions and special offers (e.g. guided tours of exhibitions). A great number of independent project websites with their own domains contributed to Linz09’s online presence. In this way, even rather complex programme formats, such as BELLEVUE, KEPLER SALON, DER KRANKE HASE [The Ill Rabbit], HÖRSTADT [Acoustic City] and LINZ. STADT IM GLÜCK [Linz. City in Luck], were faithfully rendered on the Internet; their respective project design contributed to the strengthening of their identity and boosted their recognition factor. The blog that accompanied I LIKE TO MOVE IT MOVE IT made it possible for the more than 2,000 pupils involved in the project and for others to communicate with one another directly. The image and the name recognition of the project benefited substantially. Linz09’s web editors also helped the City of Linz develop their events calendar www.linztermine.at. Operated by the City of Linz, this platform lists a wide array of events centring on the most diverse topics and interests, from the programme of the city’s theatres, concert halls and exhibition venues to events put on at markets and trade fairs that frequently involve some sort of competition or other. In the meantime roughly 800 registered event promoters are making use of this service for their purposes by filing their data themselves; the service is free of charge. Linz09’s packed programme made a separate interface indispensable, which enabled the direct import of Linz09 data to the platform. In addition to this, linztermine.at assigned a separate rubric to Linz09 which was on a par with such categories as Exhibitions or Leisure / Entertainment to give users direct access to the programme of the Culture Capital.